I can’t believe we’re still fighting for equal treatment in housing! But here we are, in 2018, filing suit in Missouri on behalf of our clients Mary Walsh and Bev Nance. Let me tell you a little more about Mary, age 72, and her wife Bev, 68. Mary and Bev both grew up in the St. Louis area, attended college locally, and spent their entire working years there. For Bev and Mary, St. Louis is as home as home gets. 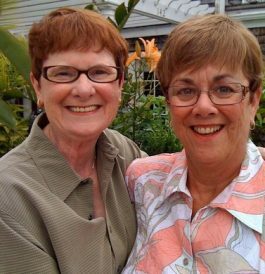 These women have been in a committed relationship since 1978, and they went, like many of us, to Massachusetts in 2009 so they could be married legally. We all know how significant it is to have our relationships recognized not just by friends and family, but by the government and the world at large. That photo you see of them on the right was taken at their wedding in Provincetown, and their smiles tell the story. Being able to finally say “I do!” – those are smiles I saw on so many faces since we won the right to marriage. Fast forward to a few years ago, when Bev and Mary started thinking about moving into a senior community for their retirement years. They wanted a place where they could live independently, but that had options for continuing care should one of them require additional assistance. After visiting friends who lived at Friendship Village, they started checking it out and it proved to be ideal for them for many reasons. They knew two couples who lived there who spoke highly of the facilities and encouraged them to move in. Not only did their friends urge them to move in, so did the management of Friendship Village. After many visits and interviews, putting down a deposit, and canceling a vacation so they could move in sooner, Mary and Bev were rejected just as they were about to sign their final papers – because they are married. That’s illegal under both Federal and state law. So last Wednesday, we filed suit in the US District Court for the Eastern District of Missouri to protect Mary and Bev and all LGBTQ elders against housing discrimination. Help us fight back on their behalf and all our LGBTQ clients who are facing discrimination by making a gift right now to NCLR. Because of the significance of this case for all LGBTQ elders, one of our most generous donors has offered to match any gift that is received before midnight tonight, July 31, dollar for dollar, up to $15,000. Can you pitch in with a gift right now of $50, $100, or even $250 when it will be matched and go twice as far to help us protect LGBTQ elders and our entire LGBTQ family? Donate now. What happened to Mary and Bev has to be among the biggest fears we face as we grow older – that on top of dealing with declining health or mobility issues or any of the myriad challenges of aging, something like this will come out of nowhere and leave us grasping at straws and not knowing where to turn for help. That’s where NCLR comes in, and why your support is so critical. If you believe that all LGBTQ elders deserve protection from housing discrimination, make a gift to NCLR before midnight tonight and it will be matched by an anonymous donor, dollar for dollar, and help us fight back against this and other assaults on our LGBTQ family. On behalf of Bev and Mary and all our LGBTQ family who will benefit with a favorable ruling in this case, THANK YOU! Posted August 3rd, 2018 & filed under Activism.